← Summer reading, so intriguing! 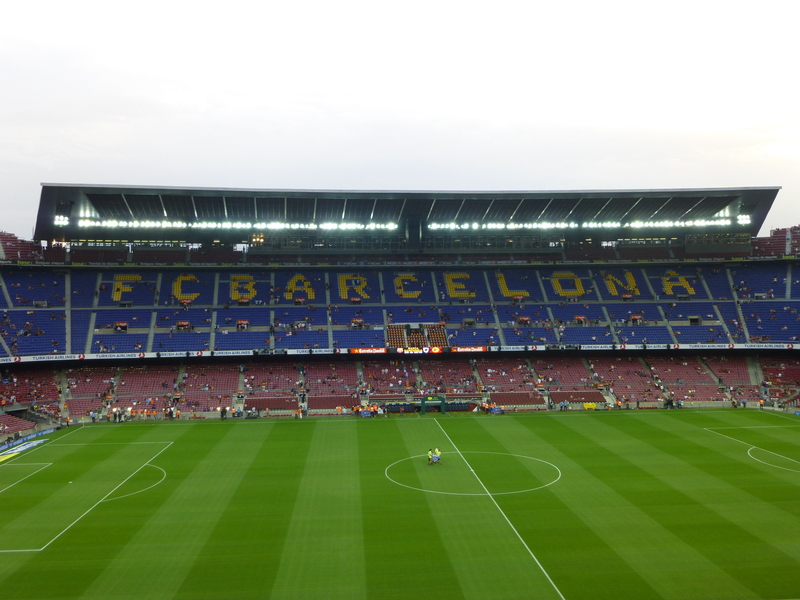 On Sunday I fulfilled an ambition and went to the Camp Nou in Barcelona, to see the mighty FC Barcelona play. To see the great Lionel Messi. We were holidaying up the coast on the Costa Brava, near a town called Platja D’Aro. We’ve been staying at a camp called Cala Gogo for a few years, in the mobile homes owned by Thomsons Al Fresco. The camp is set in the hills, with a short walk to the beach, two good swimming pools, a decent restaurant and bar, open air discos, a Queen tribute band (really), big screen for Barca games (last year we saw both the intense Supercopa games between Barca and Real Madrid) and a lovely relaxed vibe about the place. Mainly Spanish, Dutch and French campers. If you are looking for a nice place to stay with kids, this does the business. I was genuinely excited about visiting one of the true cathedrals of football. The world’s best club team, playing the intricate football that has passed through into the Spanish national team, helping them to win the last two European championships and the last World Cup. An unprecedented achievement. But it has to be said that the stadium from the outside doesn’t grab you. It’s big, but there’s no outstanding architecture – quite surprising when you think about the reputation of Barcelona, the city. I wasn’t inspired to do a photo shoot of the exterior, as I was, recently with Wembley stadium or the Olympic site (see my various blogs, in this Sportsthoughts series, or under the London category). Inside, the stadium was showing its age too. Rather utilitarian, dark, in the corridors. And went you go out to the seats, impressive in scale, but quite basic. Two thirds, at least, of the crowd would get drenched if it rained. But still, it was Barcelona. And of course the pitch itself was in magnificent condition, being heavily watered to assist that trademark slick passing. (Just like Arsenal in that respect). The team warm up. 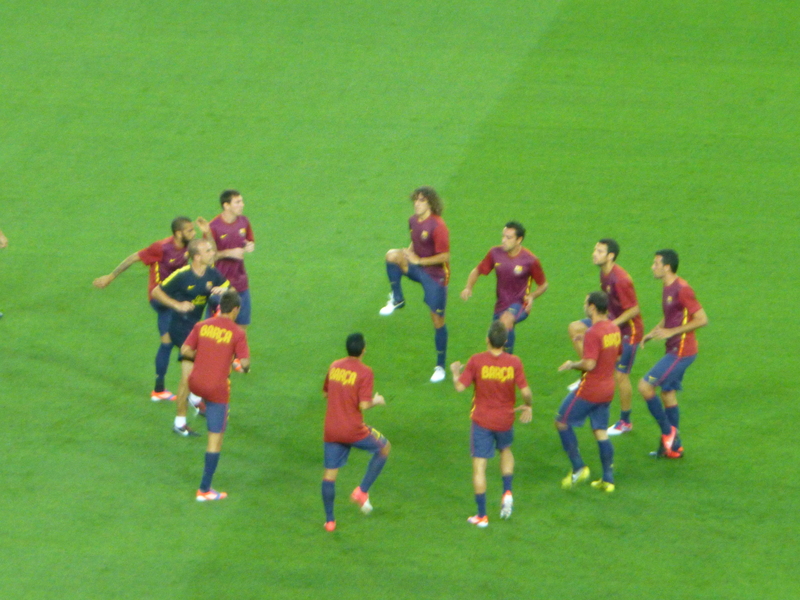 Dancing to Puyol’s tune. And then, the game. First of the season. Stadium no more than 60% full, so maybe 50,000 people. As well as holidays, I imagine some people were saving their first visit for this year’s Supercopa, which is again Barca v Real (tonight as I write), although this time with Barca merely as cup winners, while Real appear as winners of La Liga. The game was terrific. Especially the first half, when Barca took a 4-1 lead. The intensity of the second half was predictably lessened, but it had a genuinely moving moment when David Villa, who had been out of the game for a year with a broken leg, not only came on, but scored Barca’s fifth goal, after a classic move, slicing the opposition defence to pieces. We watch Barca in awe on the TV. The intricate, triangular passing and moving, spinning a web that finally bamboozles the opposition, who begin to lose shape, leaving the gaps that Barca then exploit. The extraordinary Lionel Messi, in particular. He has a different licence to the rest. He will wander anywhere, dribble, shoot from distance. Much of the rest is that extraordinarily precise short passing, probing, waiting, pouncing. Seeing the whole pitch (which you can’t do on TV, which follows the ball) you appreciate the architecture of Barca’s game even more. Players do interchange positions, especially in midfield, where Xavi, Fabregas and Messi, dropping back, were untouchable. The young player, Tello, positioned out wide left, was devasting in the first half, jinking into the penalty area cutting the ball back. Not all the passes reached a Barca attacker, but I think the Real Sociedad defence was thoroughly discombobulated by his assaults. And behind the attacking players sat Busquets, ready to mop up whenever required. Hardly visible, always present. 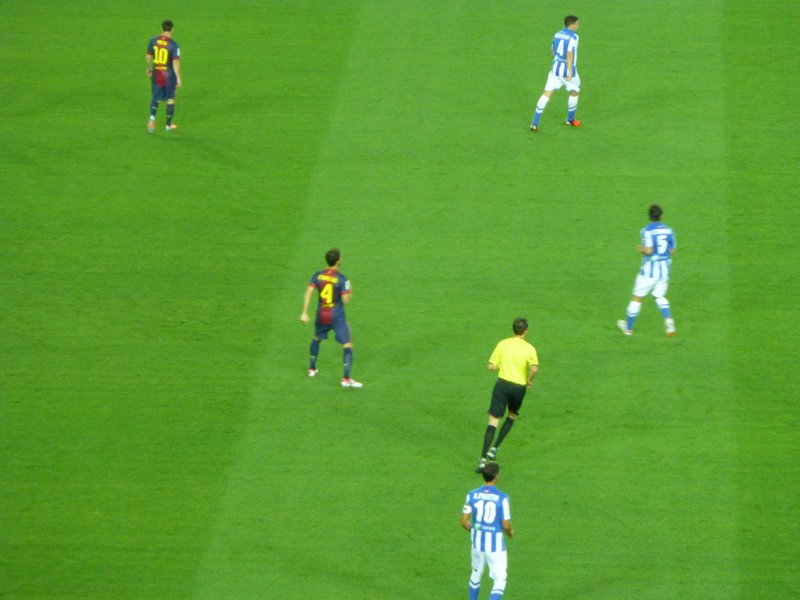 A midfield quartet, Pedro (I think) on the ball, Fabregas about to form the point of the diamond – see how he has penetrated the midfield cover – Busquets (16) hovering, Messi, the false nine, making up the four. See how closely they work together. Xavi in this case just behind, ready to join the fray, but covering for Pedro’s absence on the left, and Dani Alves’ typically advanced position, leaving the left back space exposed. 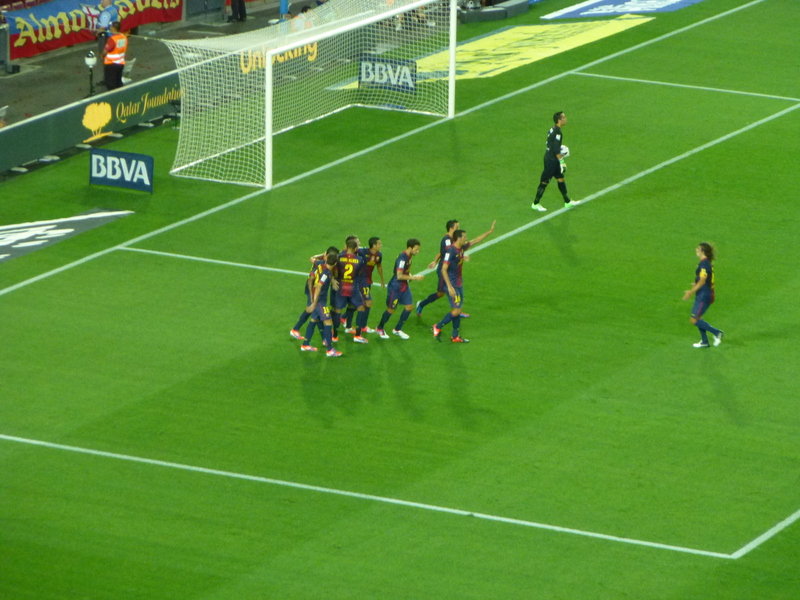 Having said all that, the first Barca goal was a simple Puyol header from a corner. The magnificent symbol of the club, the shaggy mane, nearing the end of his footballing days, but the ultimate Catalonian. The goal greeted with a special delight by the crowd. 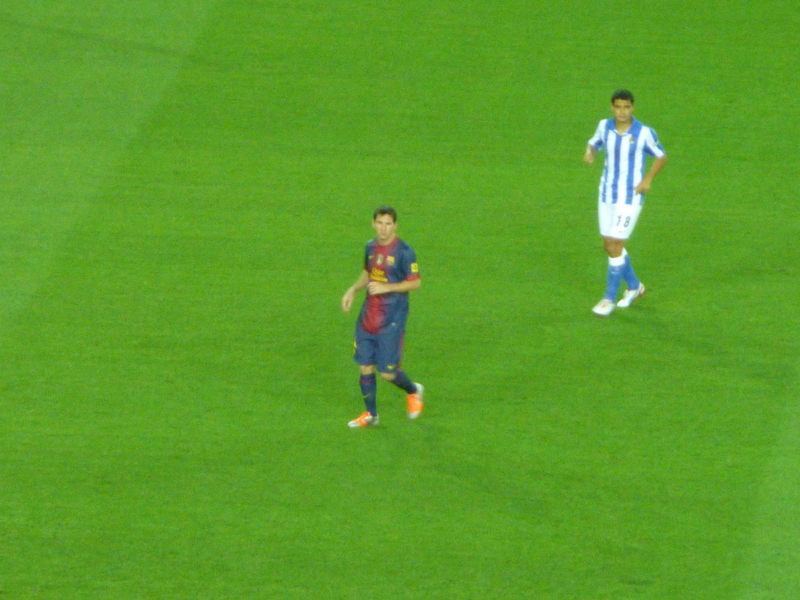 Next a Messi special, wriggling past his markers, shooting from the edge of the box. Then another Messi goal. Finishing off one of those scything moves. Pedro then took a chance provided to him by one of Tello’s runs and crosses. Clinical. Real Sociedad’s goal was a cracker too. Absolutely cut up the Barca defence at speed. A clue to Champions League challengers. An insight Chelsea used to great effect last season. The soft underbelly of Barca is the central defence. 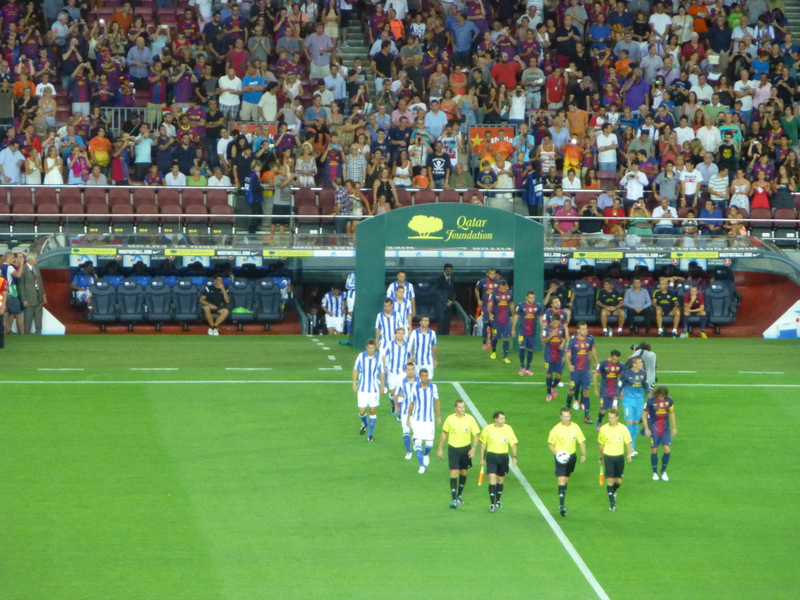 Puyol and Mascherano (a midfielder) to start, Piquet coming on in the second half. None blessed with amazing pace. Most of Barca’s defending is done higher up the field, as the midfielders and forwards swarm in pursuit of the ball if they lose it. But if you can get past that barrier, Barca are vulnerable. The question always is, do you dare commit the numbers to try? Most teams say no, and sit back in numbers, hoping for a lucky break. Rarely works. Real Sociedad, to their credit, did have a bit of a go in the first half. And conceded four. They sat deeper in the second half, and Barca probed round the edges. It was good to see Iniesta, Piquet and then Villa come on, and the game ended happily with the Villa goal. (Of course he also got booked for taking off his shirt, to reveal a message on his T-shirt). And, it has to be said, the game drifted a bit. Mexican waves began (never a good sign). As Barca weave their spells, especially if they already have a 4-1 lead, there is a soporofic air. Still a connoisseur’s delight, but not as viscerally exciting as seeing two English Premier league sides launching their frantic assaults on each other, the ball spilling every which way. Which is why the English media have suggested that Barca (and Spain) are boring. Well, only if you have the patience of a gnat. 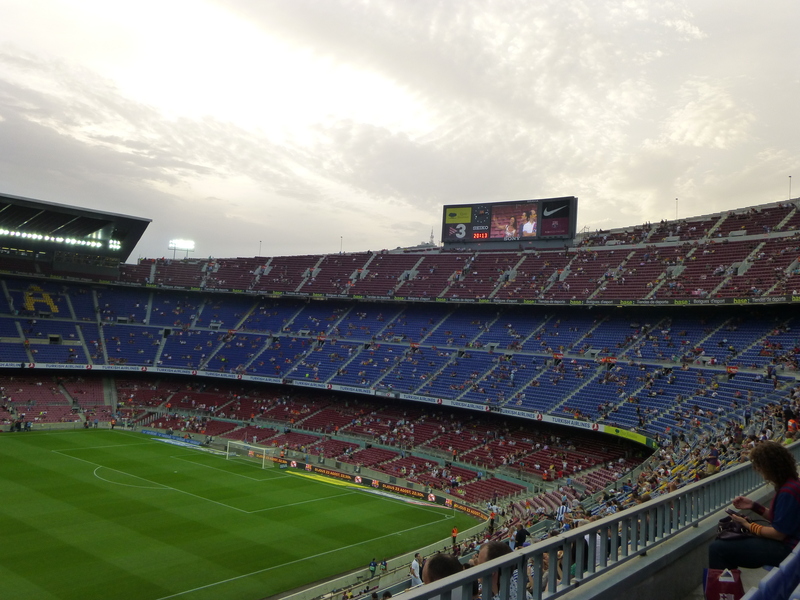 To watch Barcelona play football is a true privilege, football at its most refined – maybe the best ever. All those short passes back and forth may not always look like they have achieved anything, but subtly they change the geometry of the game, test the concentration of the defending team, until that concentration lapses, then bang! Cut to pieces. To watch Barcelona at Camp Nou, to see the genius of Messi and Xavi and Iniesta for real, is an experience I will always remember, and I hope I will return, to see Cesc Fabregas inherit the mantle from Xavi one day and become the fulcrum, the leader. Get me a season ticket now! This entry was posted in Sportsthoughts and tagged Barcelona, Camp Nou, Carles Puyol, Cesc Fabregas, David Villa, FC Barcelona, football, Lionel Messi, Real Sociedad, Soccer. Bookmark the permalink. no mention of alexandre song- was he not unveiled? has kieran’s song shirt hit the bin yet? Thanks! No sign of Song on the night. Maybe last night? Haven’t watched the game yet. Don’t think we’ll see that Arsenal shirt with Song’s name on it again. I’m wondering who will make it onto the new one.